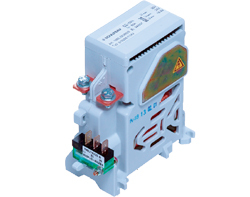 The C193 single pole contactor was developed to offer an extaordinarily high DC breaking capacity in a very small size. With an operating capability of 1000 volts, it is most suitable for heating controls; particularly on rail vehicles where it is now widely employed. Other advantages include an extended coil tolerance (+25% / -30%) auxiliary contacts, efficient magnetic arc quench and DIN rail mounting. Qualifications to Railway Standards and an enviable performance record based on the highest levels of quality control, makes this contactor the right choice for long, reliable operations.